FTTC - which cabinets and when? According to the BT Infinity website our local exchange is due to launch with FTTC on 30th September this year. Does this mean that everyone on the exchange will be able to get some kind of fibre service from that date? Or will it be a postcode lottery for the local cabinets? From looking at other posts it seems as if cabinets get rolled out individually, is there any way of checking where on the list a particular cabinet sits? Apologies if this has been answered before,all searches seem to bring back millions of hits. Thanks for your help. - The cabinets get selected individually. - No guarantee all cabinets in an exchange area will get upgraded, nor may they get upgraded at the same time. - Here in N.Ireland they tend to choose cabinets furthest away from the exchange first. No point giving fibre to people near the exchange who already get up to 20mbit or more while the outskirts get less than 5mbit. Whether the same tactic is followed elsewhere i'm not sure. - Haven't seen any definite lists of cabinets except for in N.Ireland where we have a nice drop down list to pick the exchange and see. Here in N.Ireland they tend to choose cabinets furthest away from the exchange first. No point giving fibre to people near the exchange who already get up to 20mbit or more while the outskirts get less than 5mbit. Whether the same tactic is followed elsewhere i'm not sure. Wasn't done this way here, they started out close to the exchange, and laid the fibre as they went along, further and further out from the exchange. They started work on this exchange in February, and had reached the outskirts by the end of May/Beginning of June. Im told 90% of the cabinets on this exchange were enabled, the only ones not enabled were deemed to be beyond economic return. I'm not complaining now that i have it. 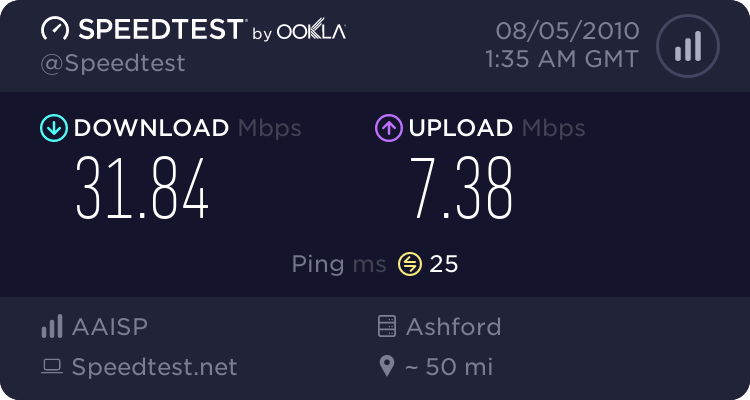 I was on 4mbit ADSL2+ before, and now on FTTC, I can upload faster than that!! And no, the exchange being enabled, means just that, the exchange end, not every cabinet in an exchange area will be done, here they enabled cabinets in which there was a good chance of some money back from them i.e cabinets serving densely populated areas. As orly mentioned, we have a website for N.I that tells you more info, I haven't seen such a site elsewhere. Thanks for your help, we live in hope! Hi Zarjaz - Really sorry for not responding to your question earlier. The exchange in question is Chippenham (in Wiltshire) code 01249. BT is still predicting 30th September on its website, and there are a number of Openreach vans out and about. I talked to one of the Openreach guys the other day who was working on pulling fibre. He was unable to tell me more and suggested I speak to customer services - I haven't done so as yet as I expect they won't tell me anything until the service goes live. Any other views? Ah, can't help there, not my area. Soz.